Trailhead is on Half Moon Pond Road in Washington, NH. To get there, take Mill Street off Rt. 31, 0.7 miles south of the center of Washington. Mill Street ends at Half Moon Pond Road in 0.3 miles; bear right and continue 2.4 miles until you see Lowell (not Lovewell) Mountain Road on the right. Park at the entrance to this jeep road. 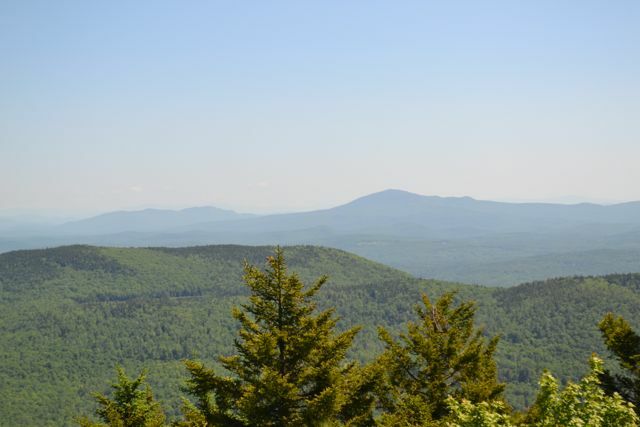 Lovewell Mountain is one of the many destinations traversed by the Monadnock-Sunapee Greenway. Many of these places are perfect for short day hikes, including Lovewell. Located in a corner of Pillsbury State Park, hikers can access it at a point where the greenway comes out of the mountains. The section of the MSG that you will be following makes use of a former road. The actual trail up the mountain is somewhat rough and steep. The trail leaves the road on the left at 0.9 miles, at a sign for Lovewell Mountain State Forest. It climbs at a moderate grade through an open forest, steepening near the top. On the left in 1.2 miles from the jeep road is a spur trail to a water source, used by the greenway hikers. A little further, on the right, is a spur to a small viewpoint. It has a view in a slightly different direction than the summit. The summit is reached in 0.2 miles. A clearing nearby yields a wide two-directional view that extends to the southern White Mountains and includes Mt. Sunapee and Mt. Kearsarge.